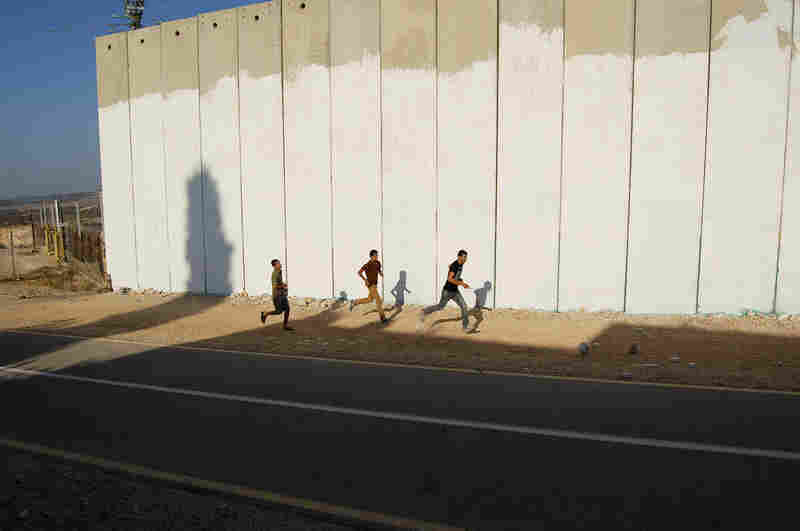 A Decade On, A Boy, A Ball And A West Bank Wall : Parallels Ishaq Amer's home was cut off from his Palestinian village when Israel erected a separation barrier around the West Bank. More important to the 13-year-old at the time was that he was cut off from his soccer buddies. An American boy saw a documentary about Ishaq's family and wanted to know what happened to them. Almost a decade ago, an Israeli filmmaker made a short documentary about Palestinian Ishaq Amer and his family after a part of Israel's separation barrier was built around their home in the West Bank. Ishaq was cut off from his soccer buddies then. Now, at 19, he's a husband and a father. Fences and a wall separate Ishaq's family home from their village. The road in front is for the Israeli military only. Behind the home, a double fence runs between the house and an Israeli settlement. At first, Ishaq's family had to wait for Israeli soldiers to open this gate and let them come or go. Now, the family has a key. 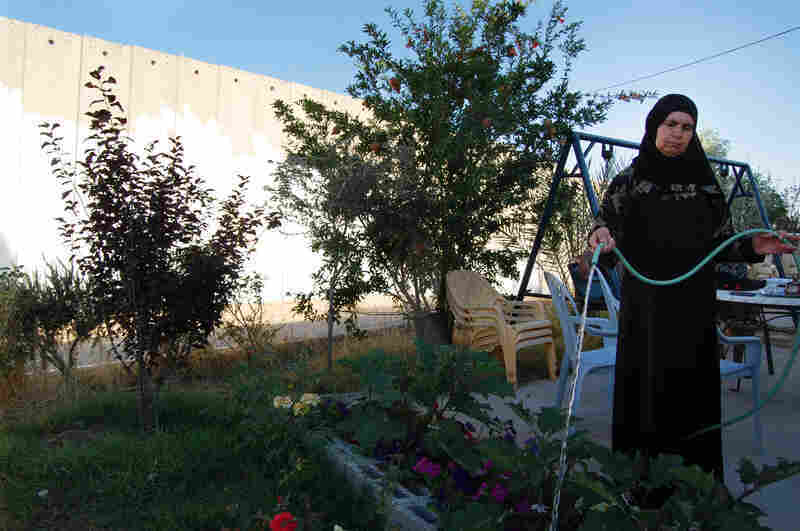 Ishaq's mother waters plants in the family's garden. The family lost a nursery business to the barrier, but have planted a few fruit trees and flowers. 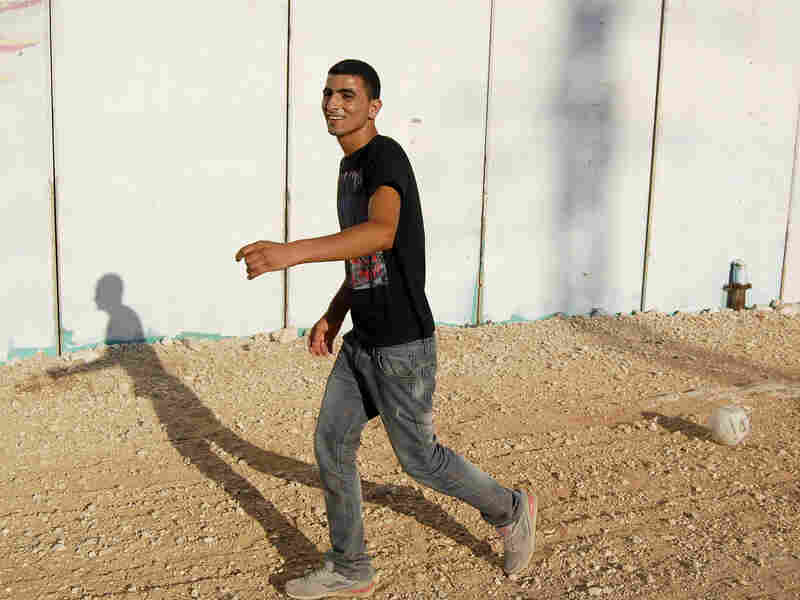 Ishaq now lives in the nearby Palestinian village, away from the barrier and Israeli settlement. He visits his parents and younger brother often, sometimes kicking a soccer ball around the same place he frequently played alone as a kid. 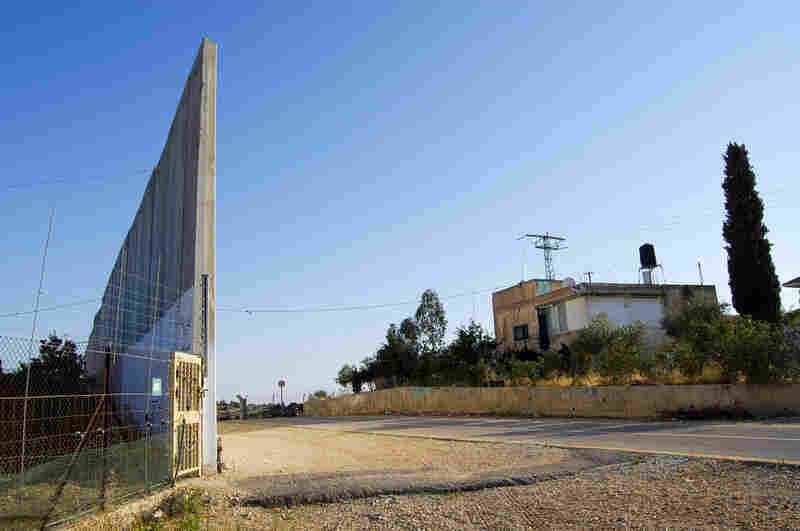 A little more than a decade ago, in an effort to improve security, Israel began building a physical barrier in and around the West Bank. 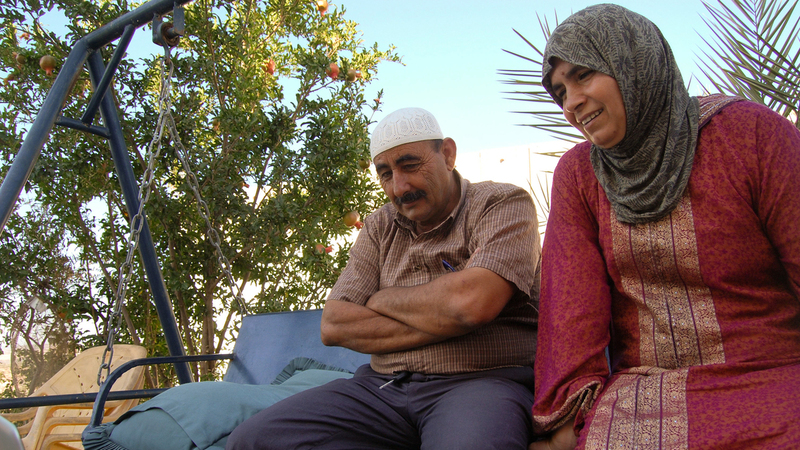 The Amer family is among the Palestinians whose lives were disrupted. The concrete wall and fence cut them off from their village. Their son was separated from his soccer buddies, the most important thing in the world to him at the time. A young American who recently saw a film about the family asked me to find out what happened to the Palestinian boy in the years since the barrier was built. Simon Hatcher saw the 15-minute documentary about the Amer family last year, in his sixth-grade class in Oregon. It stuck in his mind. Ishaq's parents watch the documentary about their family. "I watched it in class and I thought, wow, there's really this kid that can't leave his house because there are walls on both sides of it, which must be so hard for him," Simon said. "I was just like — I was really sad." The movie, Offside, shows Ishaq Amer, who was then 13, kicking a soccer ball around by himself and waiting a lot — mostly for Israeli soldiers. At first the family could leave or come home only if soldiers unlocked a gate. Seeing the film almost a decade after it was shot, Simon wanted the rest of the story. "I'd like to know if his situation has gotten any better and I'd like to know if he is able to play soccer with his friends, and I'd like to know how his life is able to go on with a wall built on all sides of his house," he told me. We found Ishaq, who is now 19 and recently became a dad. He lives in the village and works in construction. "I grew up, got married, I come and go," he says. He visits his mother, father and younger brother regularly. They still live in the house on the Israeli side of the barrier. But now the family has a key to the gate. Ishaq, 19, still loves to play soccer with his family and friends. A road from the village dead ends at the yellow metal gate. On the left, concrete barriers rise more than 20 feet toward the sky. On the right is a mesh fence with electronic sensors. Barbed wire is strung above. Just inside, there is a paved road for Israeli military use only. Across that road is Ishaq's family home. 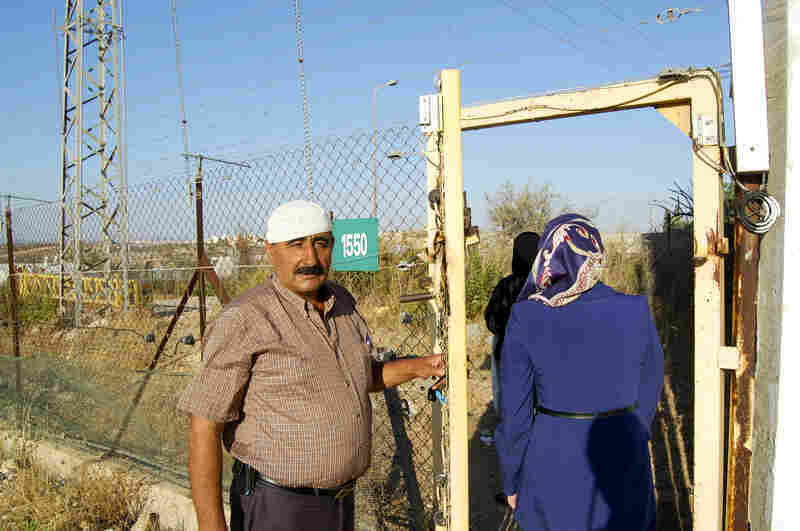 Behind the house, a double fence separates this Palestinian family from an Israeli settlement. Ishaq says he's only partly glad he doesn't live here anymore. "It's true that where I'm living now, I'm freer. There's no wall and no settlement," he says. "But I'm separated from my family and I don't like that. My feelings toward the wall are the same. It must go." The Amer family lost their nursery business when the barrier went up, but they have planted some fruit trees and flowers around the house. They raise a few sheep and other animals on their quarter acre, too. Ishaq's mother, Munira, waters petunias as she talks about the first years of the wall. She says even after the family got the key, their movement was restricted and Ishaq was frequently not able to cross the barrier to play soccer with his friends. "I remember very well when Ishaq had to play here on his own. I felt really bad for Ishaq, but what could I do?" Munira says. An Israeli court finding in the case notes that the military offered to provide a home or land closer to the village. But Ishaq's father, Hani, is proud the family is still in their home. "What is similar from those days is that our house is still walled in. What's different is that we have the key," he says. "We fought for this, and this is freedom compared to before. This makes me optimistic for the future." Ishaq's younger brother, Shaddad, barely remembers life before the wall. He is 13 now, the same age Ishaq was when the film was made. "This wall is a prison," he says. "I don't know if it will ever go." Unlike his older brother, Shaddad likes farming and writing more than soccer. Even now, Ishaq still finds some time to kick a ball around with friends.